Don't miss our delicious updates! Sign up for free! These soft and sweet butter coconut buns are super easy to make with my step-by-step pictorial to guide you! 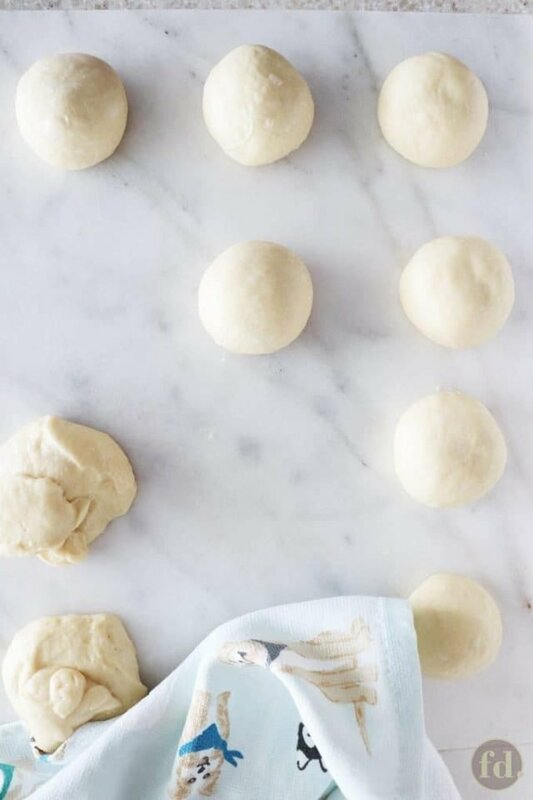 This is the only sweet bun dough recipe you’ll need. Fill with your favourite sweet and savoury fillings. Double or triple to make a large batch for any picnic or tea party! Last weekend, I posted these on Instagram, and as promised, I’m following up with the recipe for these truly delicious, pillow-soft, sweet bread buns with melt-in-your-mouth, butter coconut filling! 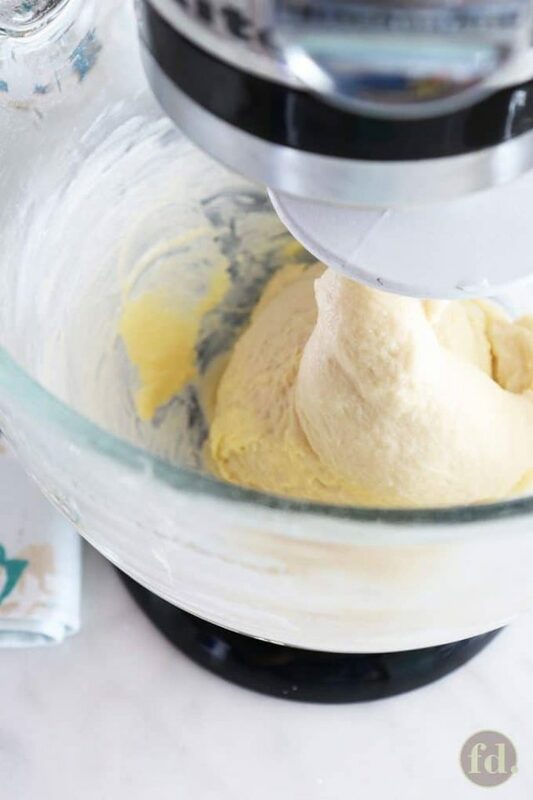 I’m super excited to share this no-fail, master bun dough recipe, which is essentially the exact recipe I learnt to work with in my course training, courtesy of culinary school. Naturally, we trained to work with, and process large batches of dough for commercial production, but I’ve scaled down the recipe here to yield the typical quantities home bakers are likely to work with. Yayyy! For you, and for me too. Because, I’m a home baker at heart. Because we’re a family of two on most days, so there’s only SO much hubs and I can eat. Because we live in Singapore, where it’s warm and humid, and bread can go stale very quicky, so I like to make just enough for two to three days, tops. 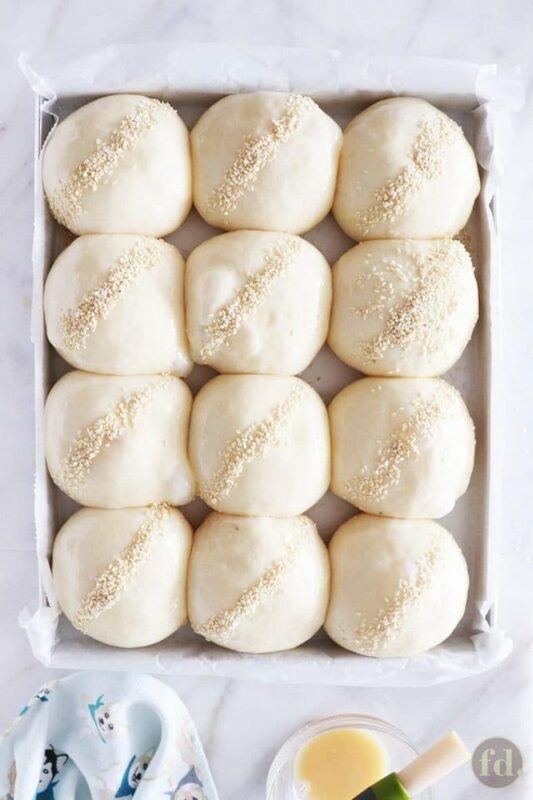 But most of all, because this is so easy to make (no need to bake ahead and freeze, though you could always do so), why not enjoy these buns as fresh as they come, in a couple of hours! 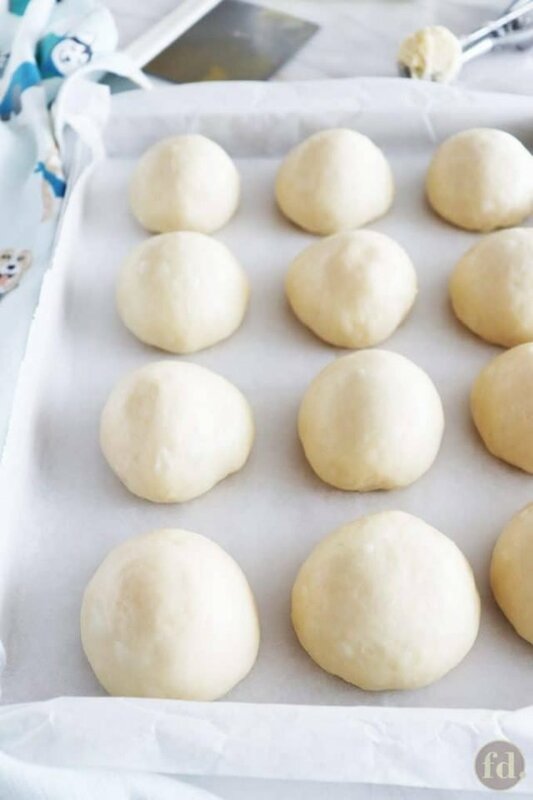 You can use this soft bun dough recipe to wrap just about any sweet or savoury filling that can hold its shape or form at room temperature. I’ve used this with my favourite bun fillings which include red bean paste, coconut jam (kaya), cranberry cream cheese , egg tuna mayo, curry potato chicken, spiced chilli sardines, and char siu (roast pork). This recipe can be easily doubled, tripled, quadrupled to make large batches for a large picnic party, for instance. Though I’ve made these as pull-apart buns (what can I say, I get a little high from the thrill of teasing apart these golden puffy pillows of deliciousness!) you can always make these as individual buns, and in any shape you like. Just be sure to space each bun at least 3 to 4 inches apart from each other, to give them ample room to rise and expand. So, let’s get through this process together, easy-peasy – I promise! This method of bread making is known as direct method, and basically, it’s a shorter and quicker process, which is what we busy home bakers can really appreciate, right? Really, all it means is that the dough comes together in one step. 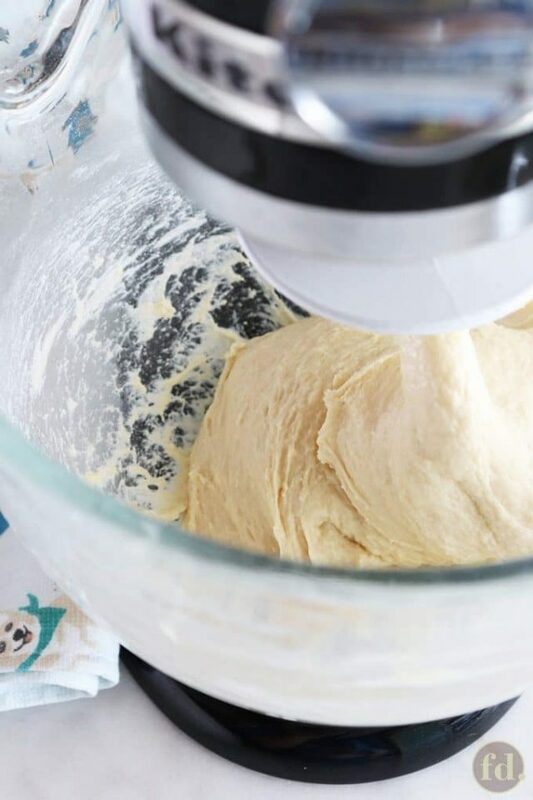 We knead all the dry and wet ingredients together (except the salt, more on that in a bit…), until it forms a rough dough. Fats (butter, margarine, shortening, etc.) are incorporated last until we get a smooth, elastic and perfectly developed dough that’s ready for shaping, filling, proofing, and finally, baking. As I mentioned earlier, adding the salt later is also known as the delayed salt method or autolyse (you can find out more about it here). Without getting into the technical aspects of dough development, it’s a very simple way to improve your bread making. This method is more crucial when making artisan bread, so if you forgot and accidentally added it in right at the start, don’t panic! Your buns will survive and will still be wonderful! Step 1. 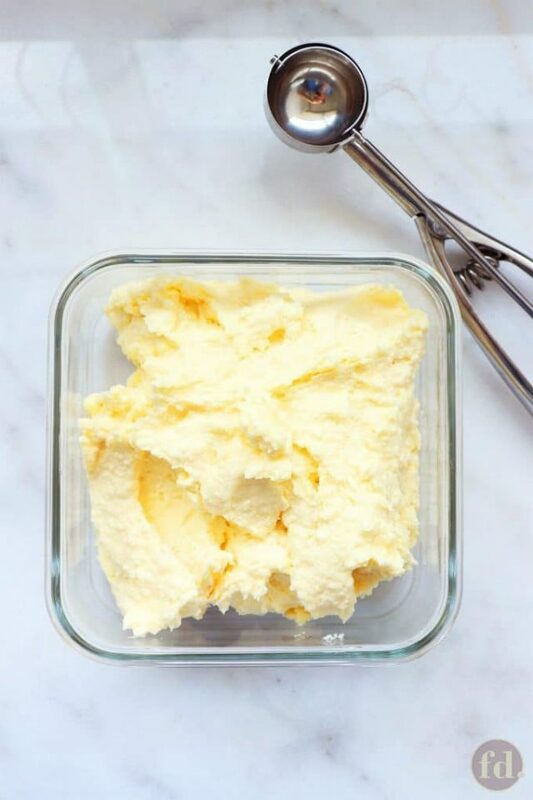 Make the butter coconut filling, and let it chill in the refrigerator to firm up. Step 2. 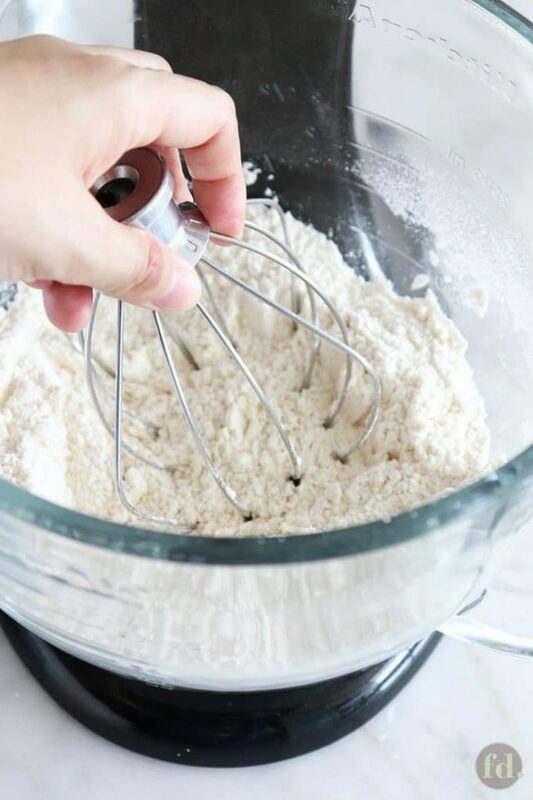 Add the dry ingredients together in a mixer bowl. Do not add salt (but if you did, hey, it’s okay!). Stir with a whisk to combine well. Step 3. Add in the wet ingredients. Do not add butter. Start the mixer fitted with a dough hook, on low speed for one minute to allow the ingredients to come together. Mix dry ingredients (do not add salt) to combine well. Add in wet ingredients (do not add butter), all together. Start mixer on low speed, and knead. 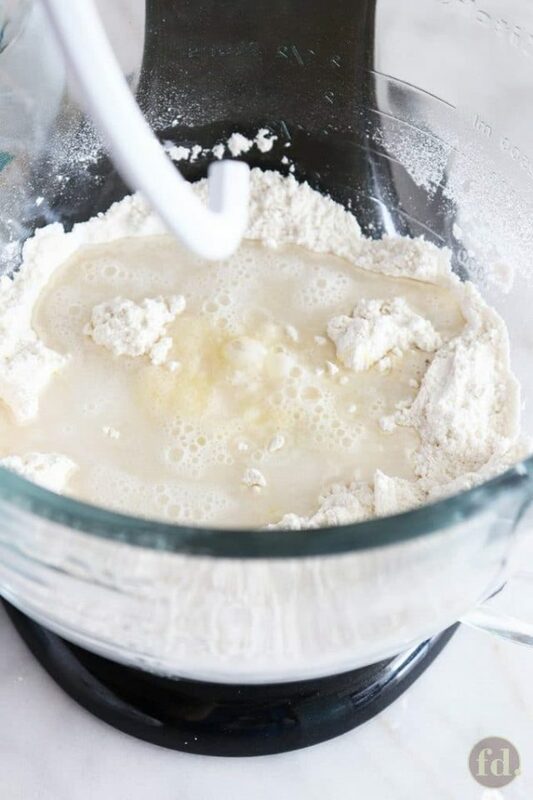 Increase mixer speed to medium-high, and continue to knead until the all the loose and dry ingredients are picked up by the rough dough and incorporated. The sides of the bowl should start to come clean. Just wait and watch the self-cleaning miracle! I love this part, isn’t it captivating? This process will usually take a few minutes, and is technically known as pickup stage. Step 4. Once the dough reaches pickup stage, add the salt and butter. 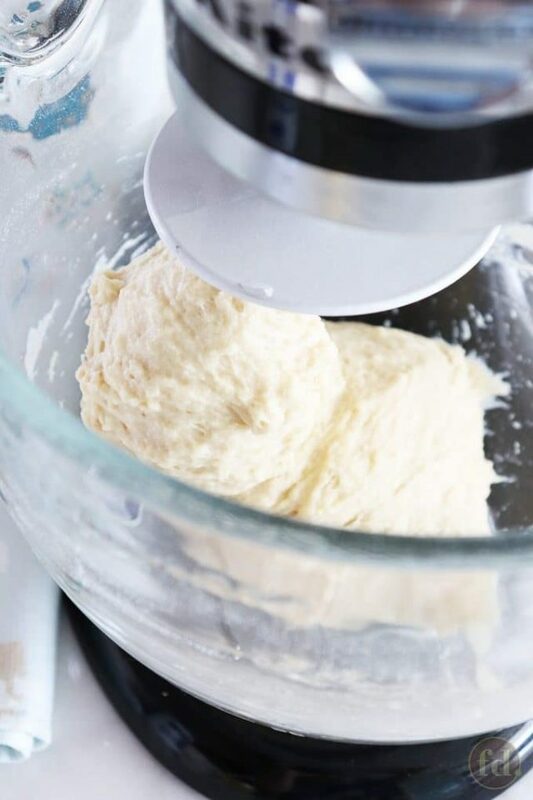 Be patient with this step, as it may take anywhere from 5 to 7 minutes of kneading at medium-high speed, depending on the speed of your mixer. 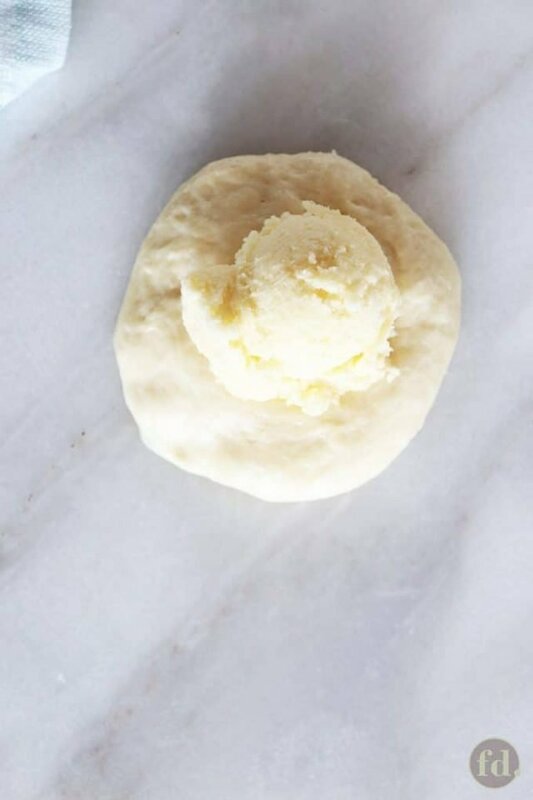 The rough dough is going to become messy, gooey and sticky as it works to incorporate the butter, but at the end of this process, it’ll have transformed into the loveliest, smoothest, shiniest dough! It’ll feel like baby skin to the touch – yes, folks, we want to get as tactile as we can with dough – touch it, feel it.. love it?. 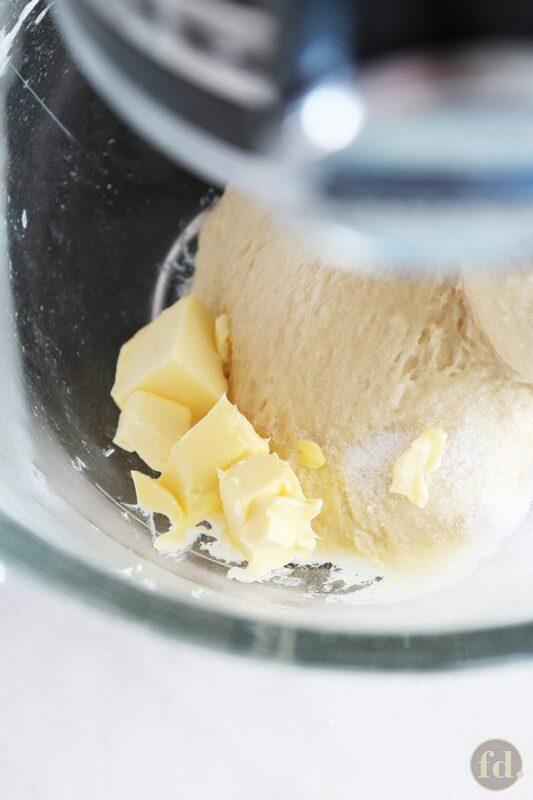 Butter is being incorporated into the dough. Dough is becoming smoother with continued kneading. Dough is becoming more developed, starting to clean the sides of the bowl. 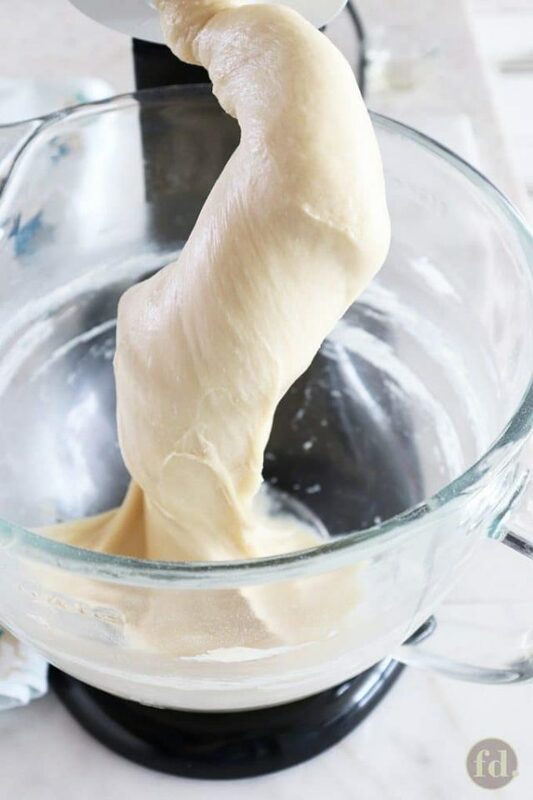 Dough becomes smooth and highly elastic. Step 5. Do the ‘Windowpane Test’. 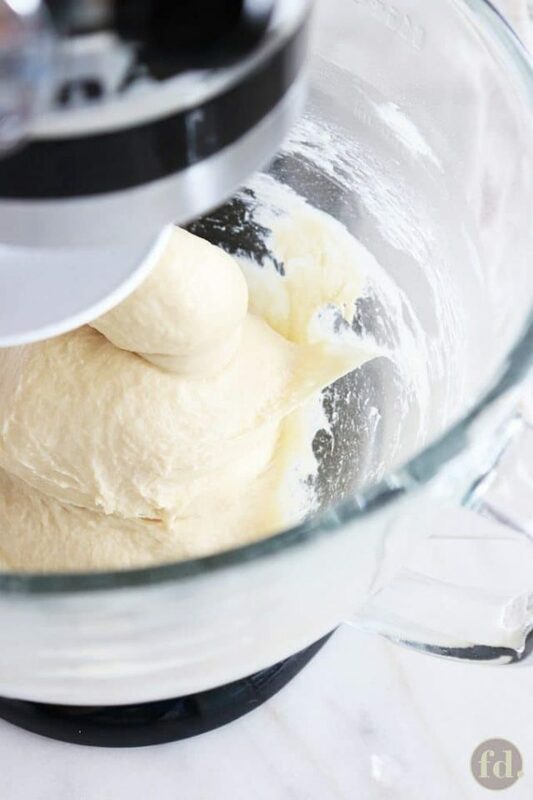 Once the sides of the bowl come clean, and the dough feels smooth and highly elastic, it’s time to stop kneading and do the ‘Windowpane Test’ to check if the dough has been kneaded enough. First, lightly grease your fingers and palms on both hands with some clean oil. Lop off a small portion of dough, roughly the size of a ping pong ball. Hold the dough between your two thumbs on the top, and your other fingers underneath. Gently tease and stretch the dough until you get a thin, translucent membrane (see photo above). If it tears before you can get there, it means the gluten (protein in the flour) isn’t developed enough. If this happens, stick the dough back with the rest in the mixer, and knead for another 2 to 3 minutes, before doing the test again. Keep repeating until you get the ‘windowpane’. Step 6. With greased hands (the dough will be quite sticky at this stage), gather the dough into a ball. Cover loosely with cling wrap, and let dough ferment for 15 minutes. Cover with cling wrap, and rest for 15 minutes. Step 6. Weigh the dough, and divide by 12 to get the weight of dough for each bun (it should roughly fall between 58 to 60 gm each). Divide into 12 portions. Shape into balls and let rest for 10 minutes. Divide dough into 12 equal portions. Step 7. On a lightly dusted worktop (I use flour as sparingly as possible to avoid drying out the dough further), flip over the ball so that the smooth side is underneath, and the rough side faces you. Flatten with your fingers into a round disc. Scoop 30 gm of filling – I use a mini cookie scoop so that the fillings hold together firmly and are evenly rounded. Place the filling in the centre of the dough. Wrap the filling by bringing the edges of the dough towards the centre with your fingertips. Gently pull the dough from all around the sides, to cover the filling evenly and smooth out the sides. Pinch and twist the ends with your fingertips to seal. 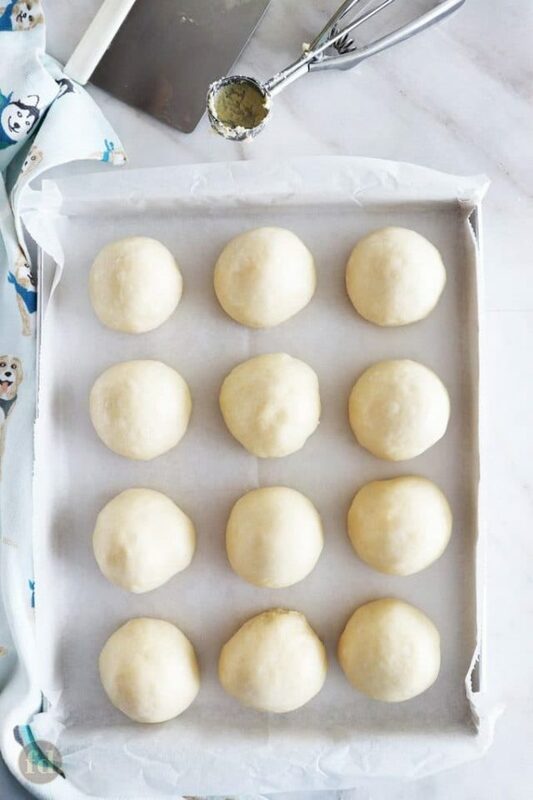 Place on paper-lined baking tray, sealed side down, spacing about 1-inch apart for pull-apart buns, or 3 to 4 inches apart for individually-shaped buns. Always have your fillings chilled and firmed up before use. Place filling in the centre, wrap and seal. Place filled balls on the paper-lined tray, spacing each apart. Step 8. Let proof for an hour, covered with a tea cloth, or until doubled in size. 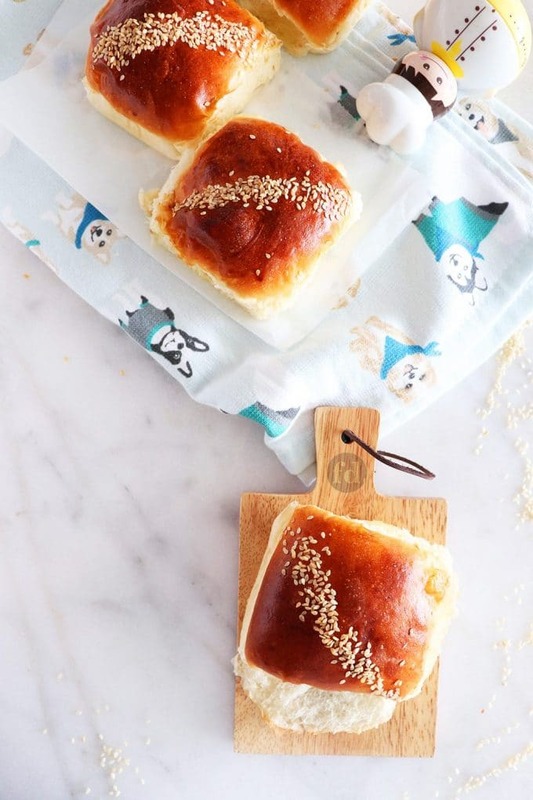 The buns are proofed enough once they feel soft, almost like a down-filled pillow, to the touch, and if you gently press a finger on its side, it leaves an indentation. Note that proofing time may vary, depending on your environment. Meanwhile, this would be when you can start to preheat oven to 200°C (390°F). Step 9. Gently brush the top and sides of each bun with egg wash, with emphasis on gently. At this point, the buns are puffy and pillow-y, and need to be handled gently. Sprinkle sesame seeds to your desire. Bake at 200°C (390°F) for 15 to 20 mins, or until a deep golden brown. Brush gently with egg wash.
Sprinkle sesame seeds as desired. When the buns are just out of the oven and warm, they will be very soft, and the butter coconut filling will be like ‘lava’ when you bite into one! Remember I’d love to see all your bakes so remember to tag @foodelicacy or #foodelicacy if you try this! Pin this now, save for later! 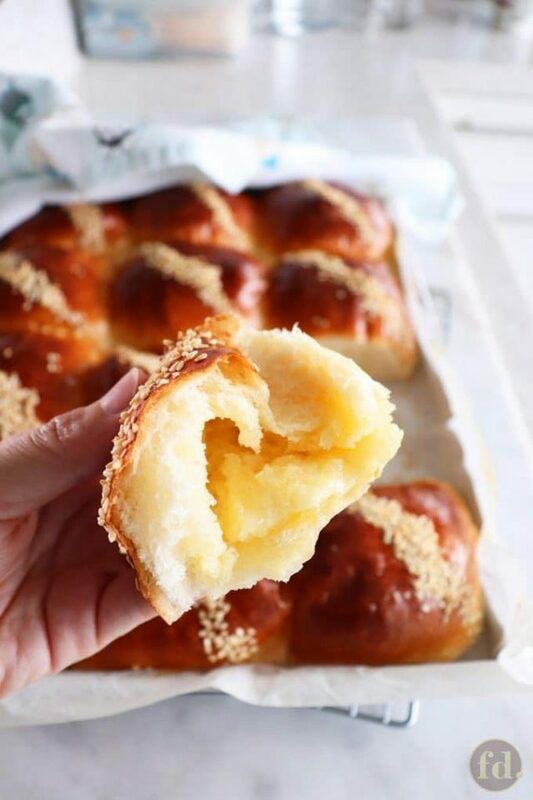 These soft and moist butter coconut buns are super easy to make with my step-by-step pictorial to guide you! 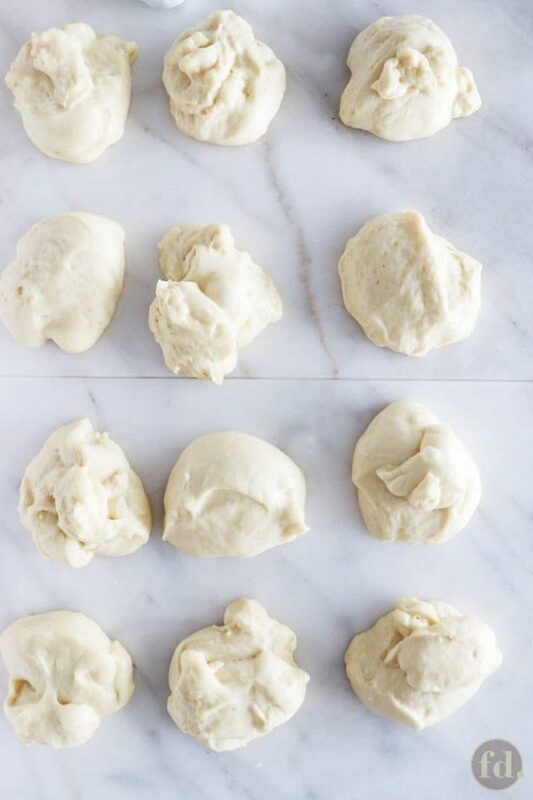 This is the only sweet bun dough recipe you'll need. Fill with your favourite sweet and savoury fillings. Double or triple to make a large batch for any picnic or tea party! Using a mixer fitted with a paddle attachment, cream butter and sugar on medium speed till light. Add plain flour, corn flour, milk powder and desiccated coconut. Mix till well combined. Refrigerate until firm. Store extra filling (if any) in air-tight container, and freeze for up to one month. Line a 11 x 14-inch baking tray with baking paper. 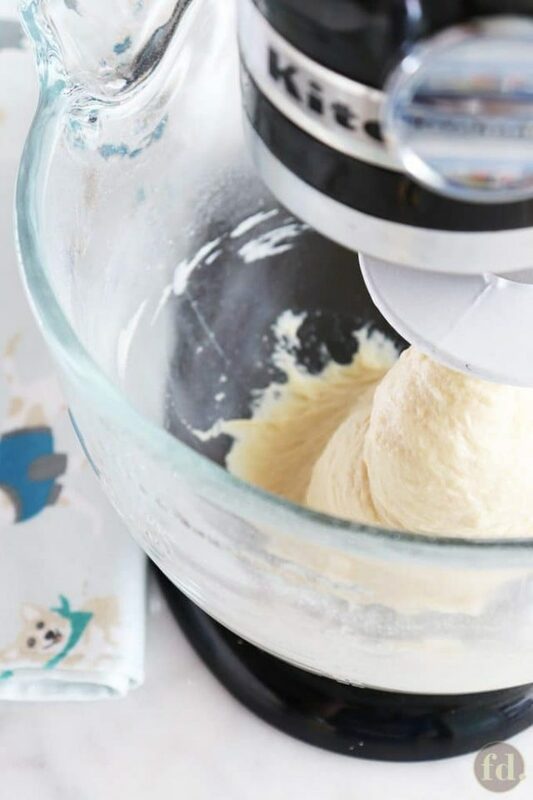 In a clean mixer bowl, combine bread flour, milk powder, custard powder, yeast, bread improver (optional), and sugar. Stir with a whisk to combine well. Add egg, vinegar, water and milk (Tip: for egg measurement, beat one whole egg to mix yolk and white evenly. Weigh out 38 grams, set aside the remaining egg for egg wash. You can add 1-2 tsps of milk to make more egg wash, if needed or desired). 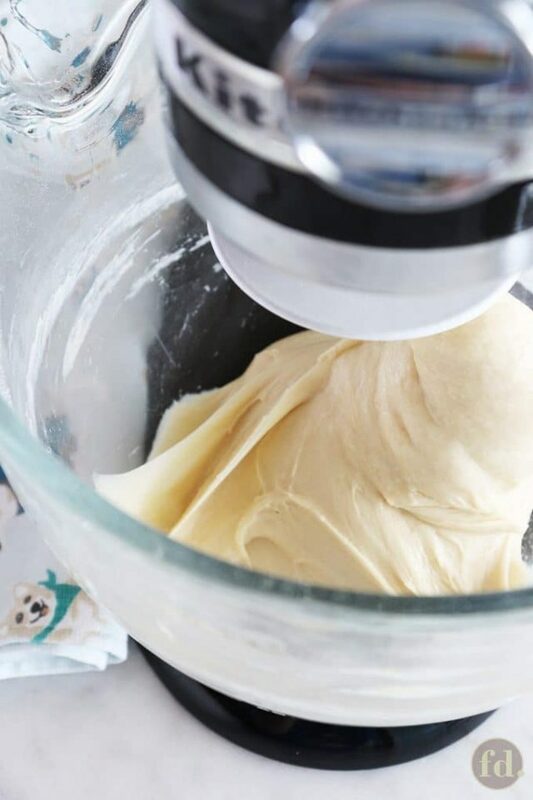 Fit the mixer with a dough hook, start on low speed for 1 minute to allow the ingredients to come together as a rough dough. Increase speed to medium-high, and continue to knead until the dough cleans the sides of the bowl (pickup stage). Add the butter and salt. 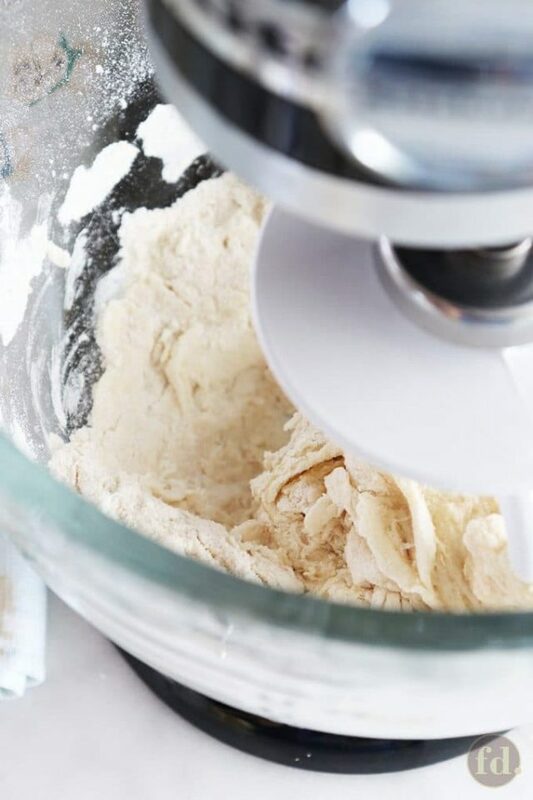 Knead at medium-high speed until the sides of the bowl come clean, and until the dough is smooth and elastic. This may take 5 - 7 minutes. Do the 'Windowpane Test' (read recipe notes below). Once 'windowpane' is achieved, gather the dough into a ball. Cover loosely with cling wrap, and let dough ferment for 15 minutes. Weigh the dough, and divide by 12 to get the weight of dough for each bun (it should roughly fall between 58 to 60 gm each). Divide into 12 portions. Shape into balls and let rest for 10 minutes. 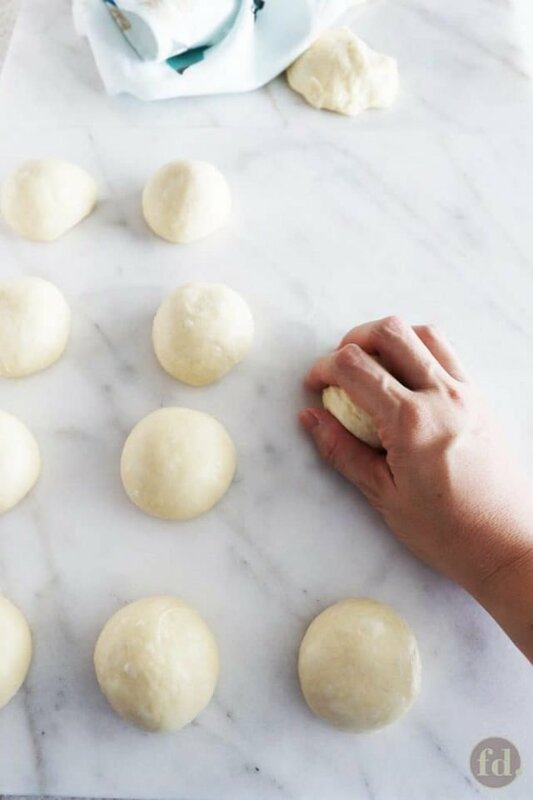 On a lightly dusted worktop, flip over each dough ball so that the smooth side is underneath, and the rough side faces you. Flatten into a round disc. Place 30 g of filling in the centre of each dough, wrap and seal. 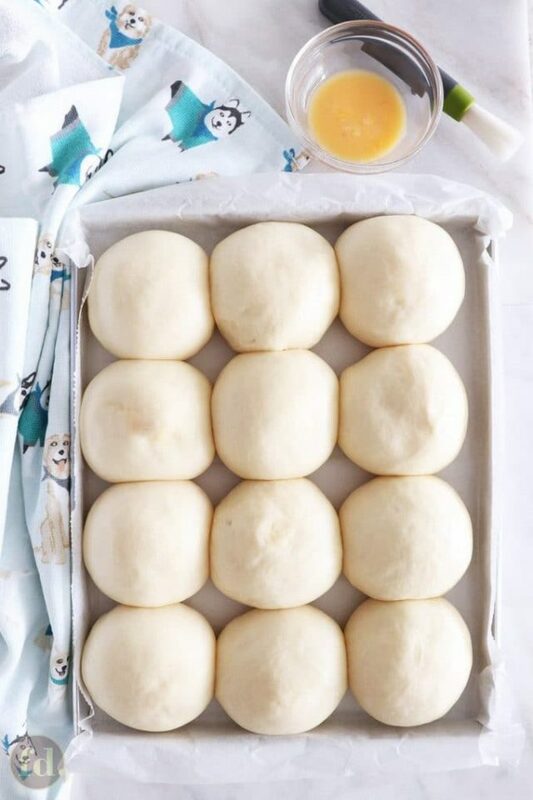 Place on paper-lined baking tray, sealed side down, spacing about 1-inch apart for pull-apart buns, or 3 to 4 inches apart for individually-shaped buns. Proof for an hour in a warm place, covered with a tea cloth, or until doubled in size. The buns are proofed enough if you gently press a finger on its side, and it leaves an indentation. Meanwhile, start pre-heating oven to 200°C (390°F) . Gently brush the top and sides of each bun with remaining egg wash from (2) above. Sprinkle sesame seeds to your desire. Bake at 200°C (390°F) for 15 to 20 mins, or until buns turn a deep golden brown. All ingredients are measured by weights to allow ease and accuracy for large-batch production. For example, you can double, triple, or multiply the weights of every ingredient by the desired factor, to get quantities you require for your needs. Bread improver can be omitted from the recipe, if desired. It is added here as it provides nutrients for the yeast and increases the volume of the dough. It also enhances the texture of the baked buns and extends its freshness. It is highly recommended to incorporate a good quality bread improver when making large quantities of dough for commercial production, or in instances, where you want to improve the shelf life of the baked goods, for instance, for a bakery production. There are many types of bread improvers - some are intended for use in baking crusty breads like artisan breads, and others for soft bread like these buns - so please choose one that is suitable for soft bread production. Milk and Milk powder enhance the flavour and colour of the baked dough, as well as increases it's nutritional value. It is highly recommended to use whole or full-fat milk powder, wherever possible. Custard powder contains modified starch which increases or enhances the ability of the dough to absorb water. It can also impart a slightly creamy yellow tinge to the baked dough, making the bun or bread look 'richer'. The 'Windowpane Test' is done to check if the dough has been kneaded enough. To do this, lightly grease your fingers and palms on both hands with some clean oil. Lop off a small portion of dough, roughly the size of a ping pong ball. Hold the dough between your two thumbs on the top, and your other fingers underneath. 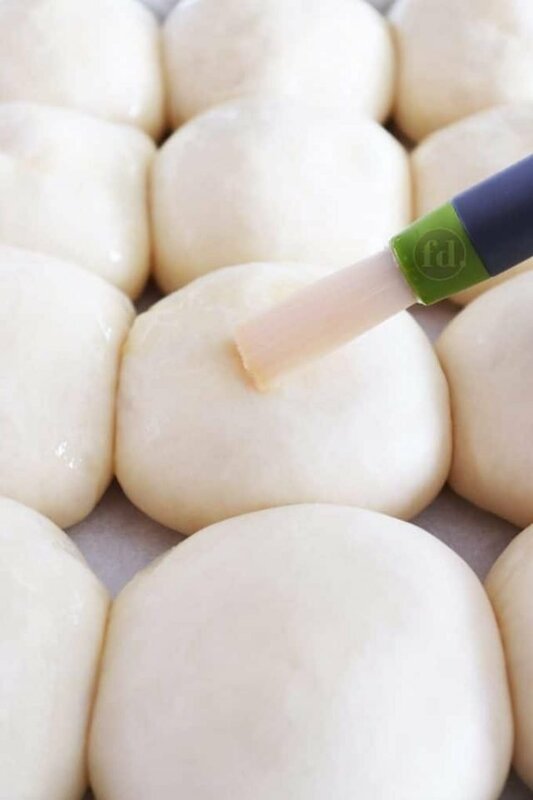 Gently tease and stretch the dough until you get a thin, translucent membrane (see photo above). If it tears before you can get there, it means the gluten (protein in the flour) isn't developed enough. If this happens, stick the dough back with the rest in the mixer, and knead for another 2 to 3 minutes, before doing the test again. Keep repeating until you get the 'windowpane'. Did you try this recipe? Share it on Instagram!I'd love to see! Don't forget to mention @foodelicacy so we can drool away with you! Don't miss our delicious updates! Get our latest posts by email, free! Previous Post: « Fish Head Curry – Easy, Delicious, Make-from-Scratch Recipe! Hi Joanna, I didn’t need to grease the baking paper when I bake these buns as they usually come off the paper clean and easy. Hello! Do you need to oil the baking paper? Hi Umairah! That’s awesome to hear, congratulations! Glad you were happy with the texture of these buns. Yes, if the buns tasted just a little yeasty, it’s likely they were slightly overproofed. One sure way of knowing that your bread or bun dough is ready for baking, when you press your index finger gently on the side of the bread/bun near the base, it leaves an indent without springing back. But this will also be the case if it’s overproofed. You’ll learn to recognise when it’s proofed enough, it’ll feel pillowy. I’ve tried it again. This is my 5th time trying to be honest haha and it turned out to be soft and fluffy! However, it taste kinda yeasty. Do you think I proofed it for too long. I live in Melbour e so weather is pretty unpredictable. Can the dough be overproofed? I left it out for a while after shaping as some times the weather is abit cold. Hi Umairah, I’m afraid this recipe is not intended for making the dough in a breadmaker, recipes for breadmaker can be quite different. Try adding a little more flour, just enough until it doesn’t quite stick to your hand. Hope it works out, but not sure how the texture will turn out. Please do share, ya? Hi Celia! Its me again. I tried ur recipe using breadmaker using the dough setting however the dough became very sticky and hard to make into shapes. Tried using abit of flour too but as you said use sparringly and it was still sticky. Is it normal? Or it probably doesn’t work with breadmaker? Hi Umairah, yes you can use margarine in place of butter, just check if your margarine can be used for baking purposes, and not for spreading only. In my humble opinion, butter adds better flavour and it contains at least 80% fat, which would yield a moist and tender texture. But certainly, margarine will work out well too. Hope this helps! Hi is it possible for me to swap butter for margarine? Will it make any difference in the bread texture? Hello Gia! Thank you! Here in Asia, corn flour and corn starch are the same. So I would say, if you have corn starch, use that. Happy baking! Hello! This recipe looks amazing! I wanted to ask you if corn flour is cornstarch in the U.S. or is it really cornflour which is finely ground cornmeal that we have here? Thank you! Hi Jenny, thank you so much for writing in! I’m thrilled that your banana cupcakes were a hit with your friends, congratulations! I’m not sure what could have caused the cake to break up easily when baked in a cake pan, as I have done this without problems. Once you pour out the batter into the cake pan, try giving the cake pan a few taps on the counter, to remove trapped air bubbles. Also, you will need to adjust baking temperature slightly as cupcakes usually bake at higher temperature, with shorter time. For batter in round cake pan, try 170 deg C, for 30 to 35 minutes. Hope this works! i have tried your banana cup cakes with very good feedback from friends. recently i bought an 8 inch cake oan and use it to bake this recipe. the cake comes out beaitiful but when i cut the cake. the cake beaks into snall pieces. Hello Tam Dang, thank you for your concern. I am fine, hope all is well with you too. I have been super busy these few months, I hope to get back to posting more recipes soon! Hello! How are you? Longtime no hear from you? Hope all fine with you. Hello there! I’d love to address you by your first name, but the comment shows SYB. So glad you found these buns delicious too! 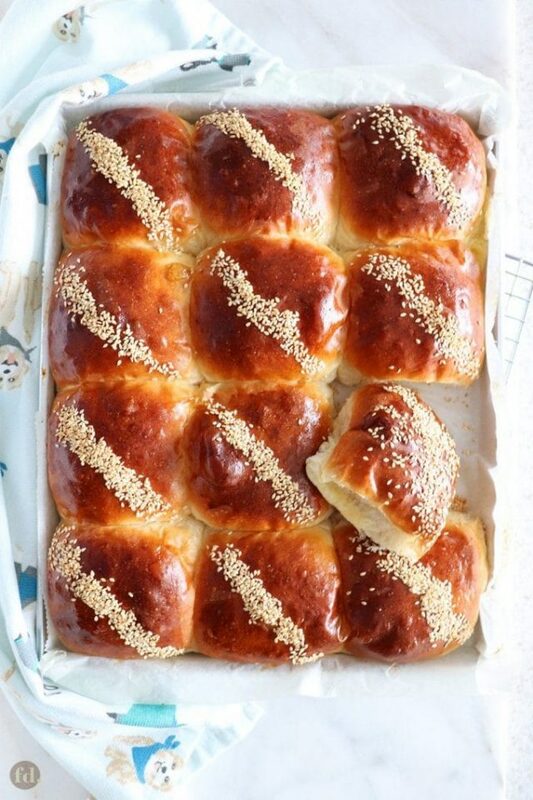 These buns are great when filled with sweet as well as savoury fillings too. Chocolate creme pat sounds so yummy, I’d love to hear how that tasted! Thank you for sharing! Hi Celia, I made these buns today and they are delicious. Thank you for the precise recipe! I filled a few with leftover chocolate creme pat but will wait to try those tomorrow! Hi Celia, I made these today and they are delicious. Thank you for the precise recipe! Hello Adelene, thank you so much for sharing and your wonderful feedback!? I was so bowled over, and you really made my day that much happier! I’m honestly so thrilled that the recipes you’ve been having a go at, have all turned out so successfully for you. I think this shows how incredibly talented you are at this too!???? I definitely agree with the banana spongecakes being a tad sweet, so I’ve adjusted the sugar in the recipe to 200 gm, sort of a middle point between 150 gm that you went with, and 250 gm. Thank you so much for the feedback, and definitely, streusel topping is like the icing on a cake! Brilliant of you to up the ooomph factor on these cupcakes! I can’t wait to try that myself!? Hope you’ll keep your stories and feedback coming, I’d really love to hear ALL of it!! Take care and have a wonderful week ahead! Hi Celia, thanks for your wonderful recipes! I halved this recipe and achieved soft and moist butter coconut buns like the title of your post suggests. The results for the buns were very similar to the tang zhong method which I use to make whole loaf breads. I also like that the butter coconut filling was not too sweet, and I added a pinch of salt to the filling for good measure – which worked out very well! I wanted to let you know that I have tried a number of your recipes and achieved great success with them, in particular, the banana sponge cupcakes [I only used 150g of sugar for that one, after reading reviews that 250g of sugar might be a tad too sweet. And I added a streusel topping, cos who doesn’t like streusel right? ? The results were amazing, my colleagues had nothing but praise for the sponge cakes! ], pandan chiffon cake, char siew, black bean with pork rib soup. I hope that you can continue to share your awesome recipes, clear and detailed instructions and beautiful pictorial aids. ? Hi Catherine, thank you for writing!? You can omit the milk powder, however the buns may be less flavourful. Thank you for sharing the bread recipe. I prefer sandwich loaf and will,try to make one. However, I don’t have milk powder and winder if it can be omitted. Hello Florence dear! Of course, I remember you..lots of great memories of my youth were the times we spent together on the BSRC courts! So glad you found me through my blog! Thank you for trying out the recipes I share here, hope you and your family enjoy! Please share whenever you have time on the recipes you cook and bake, ya, I’d love to hear from you! Take care of yourself too, and have a wonderful weekend! Hi dear Celia, I am Florence boon fm Brunei and good friend with Meng Fong. Hope U still remember me as we have been playing basketball at BSRC court in the early 20ths…love yr baking and cooking and will use yr receipe to bake the lovely buns this weekend. Take good care. Hi Elaine, thank you for writing in ? I’ve never tried the tang zhong method, so I can’t speak from personal experience how these soft buns would compare. I’m hoping you could try this recipe and share with me ?. 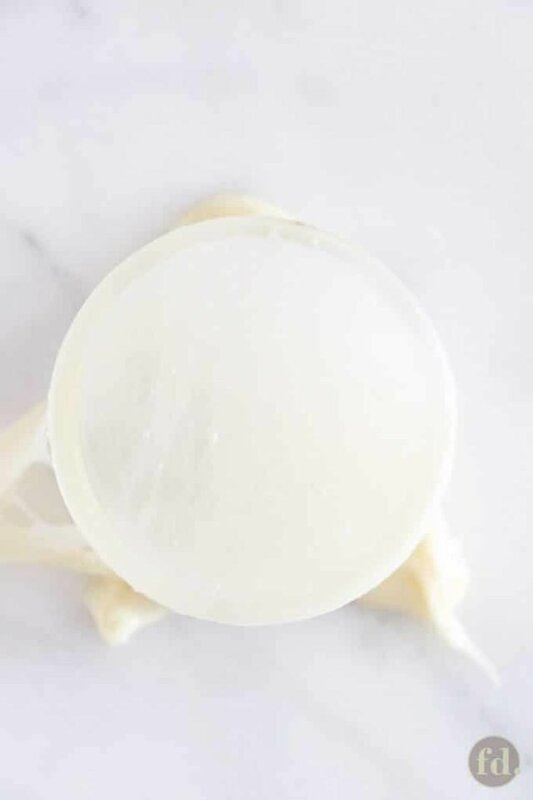 In a way that is similar to the aim of the tang zhong method, the custard powder contains modified starch which increases and enhances the ability of the dough to absorb and retain moisture, which helps it stay moist. The use of a good quality bread improver would help improve dough rise, enhance the texture of the bun and improve shelf life. My buns stayed soft and moist, when stored in an air-tight container, for up to 5 days to a week, in our humid weather in Singapore. I’m hoping you’ll find this direct method dough an easier and less laborious way to enjoy soft textured buns. Hope you’ll give it a go! Hi Josephine, yes, it would be highly recommended?I’ve included a tip in the recipe instruction how you do this. And you’ll still need the remaining egg for the egg wash, so absolutely no waste!? Do I ve to measure the eggs 38 gms? Hi Gina, you can omit custard powder. Personally, in my own experience using soft bun dough recipes with, and without custard powder, I often find that the buns turn out more moist and tender with custard powder included.? You could try without, and see if you like how the buns turn out. Hope you can share!? Like to check are we able to omit custard powder or replace it with something else? Hi Ms Tam Dang, thank you so much for sharing your bake with me!? You did such a wonderful job with your buns, they look wonderful!! ?I’m so happy you loved how it turned out! Enjoy!? I’m so happy to share with you my bread just baked. The coconut filling not have nice color as same as your bread (i dont know why, maybe due to the quality of butter @@). However the bread so delicious, soft, moist and filling so tasty of butter, coconut. I do a little brush with whipped cream for shining. Thank you so much for your reply. I will try it this afternoon and hope can share with you my successful bread. Hi Ms Tam Dang, thank you so much for writing in!? Glad to have found another coconut lover in you! Vinegar, when added to a bread recipe in the right proportion, can help dough rise, and improves the overall texture of the bread, making it softer and more ‘springy’, generally speaking?. Too much vinegar can retard the function of yeast, so it is important to add the right amount. Thanks so much fir the wonderful recipe, I love all recipes with coconut :). Could you please kindly help me a little knowledge in this recipe that what the purpose or function of vinegar in dough? Normally I only see the wet ingredients such as milk/water/whip cream/egg however this is he first time I see vinegar in bread dough. Thank you so much and wish you all the best. Tried this Recipe? Rate it! Don’t Ever Miss A Recipe! Get our delicious updates, free!